Eugene and his wife, Minhee, are the founders of One Day’s Wages. Eugene leads the ODW team as the Executive Director. He’s also the founder of Q Cafe–a community non-profit cafe and music venue–and pastors a Christian church in Seattle, Washington. He received his B.A. from University of California, Davis and his Masters degree from Princeton Theological Seminary in New Jersey. He has a great commitment to issues of mercy, justice, and compassion–much of which was formed through his research trips to South Africa, Central America, Central Asia and Southeast Asia. He and his wife founded One Day’s Wages because they were simply challenged that while they couldn’t change the entire world, they could nevertheless make an impact in the lives of others. Their hope and vision is not to give handouts but to assist, equip and empower people to help one another lift themselves out of poverty. Eugene has been featured in numerous publications such as the New York Times, Seattle Times, and NPR. He and his wife, Minhee, have been married for 13 years and have 3 kids. You can follow him on Twitter or his blog. 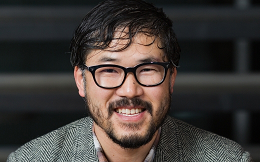 This entry was posted in Award, celebrity, honoree, Recognition, women and tagged church, community, Eugene Cho, Minhee Cho, minister, New York City, non profit, ODW, One Day's Wages, pastor, Seattle, Today's Honoree, writer. Bookmark the permalink.